It’s not my fault. It’s Ollie Hopnoodle’s. When my grown kids suggested we take them and our grandchildren camping on the lake this summer, I couldn’t wait. I had an excellent role model to follow. 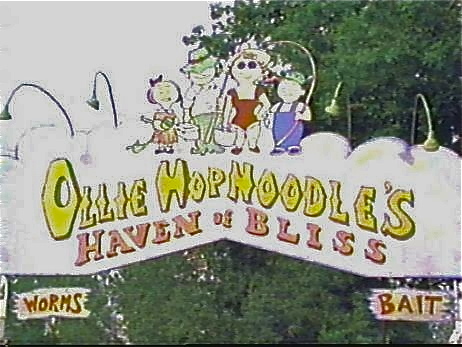 In case you never had the privilege of seeing it, the satire of childhood recollections of annual family vacations to the lake will never be topped by the 1968 movie, Ollie Hopnoodle’s Haven of Bliss. 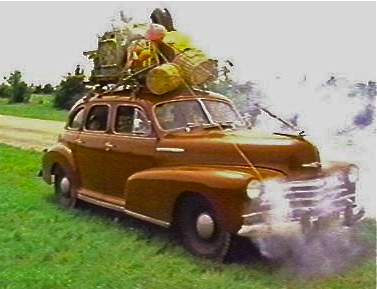 The picture perfect movie trip includes happy mom and dad Parker and two boys, Ralph and the younger, whiny Randy. Running out of gas, an overheating radiator, a flat tire, missed detour signs and constant stops to shop for the “perfect” yard art…surely you’ve been there. It’s the way life should be. There were no personal electronic devices on the way to Ollie Hopnoodle’s. When they get to the lake, Ralph unpacks the car in growing fear because he only had one thing to pack — the fishing tackle box — and he knows he forgot it. When he gets to the bottom of the trunk, to his amazement, he spots it — just at the time the Old Man puts his hand on Ralph’s shoulder and they just smile. Thanks Dad. The trip includes the Old Man having to go way off route to find the only gasoline he’ll put in the family car — Texas Royal Supreme Blue. They are stuck for miles follow a poultry truck for miles through flying feathers and splatting white stuff — in a no passing zone. At the third junktique stop, Mom finds the perfect Dutch lawn windmill for the yard back home, which is strapped to the top of the other stuff on top of the car. Of course, when they get to Clear Lake they find that “all the fish stopped biting” just a couple of days ago.” That news comes minutes before a light rain turns into a heavy rain and turns into numerous leaks in the cabin that require every pot and pan to catch the drips. I think you get the picture. My family has watched the movie numerous times and it goes way past anything the Brady Bunch could ever come up with. We laugh every time we plan a trip like this summer’s. But we go after it with the tenacity that only the Parkers could understand.